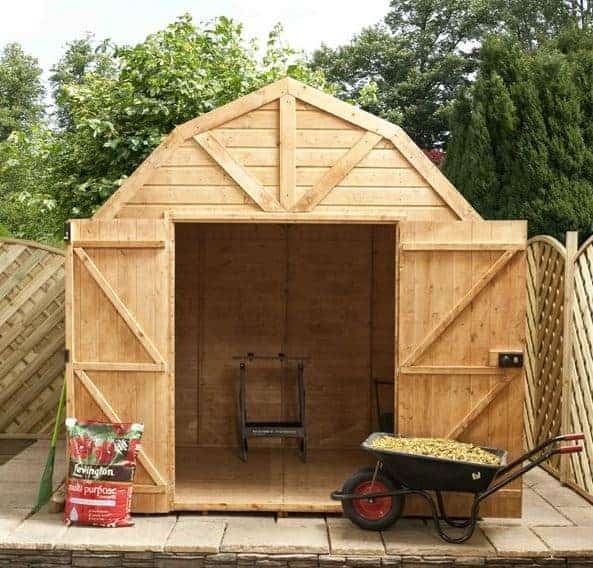 This dramatic, incredibly attractive large Dutch barn style shed is ideal if you’re looking for something bold and different. Waltons supply a number of variations of this shed and this one comes with a large, rectangular window. Styrene glazed, this great shatterproof window can be opened to provide ventilation into the building. This really adds to its comfort levels in hot weather; especially if you decide to use it as a gym. Tongue and groove cladding is used throughout the construction, including the floor and roof. This is a great feature as it means the floor will be able to hold heavy equipment or machinery without posing a risk of damage. The apex roof has a slightly different design than standard apex roofs featured on outdoor buildings. However, it still offers the same great water-resistant benefits. It is also covered with heavy duty mineral felt to further add to its longevity. You’ll find the doors of this building to be particularly impressive. They are built with exceptional quality and sturdiness in mind. As the shed has a barn design you will also find the doors open out extremely wide in comparison to other outdoor storage sheds. 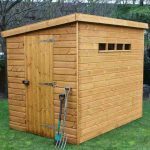 Complete with a 10 year warranty, this is an exceptional shed that will truly withstand the test of time. Extra floor braces may be needed if storing heavy equipment. However these are simple and inexpensive to install. This is a medium size Dutch Barn style storage shed. The building comes in several variations, with most offering a windowless design. 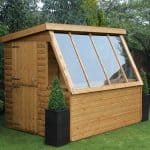 This shed is one of the few in the range that features a styrene glazed window. 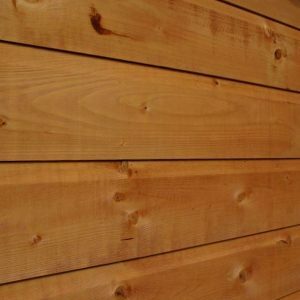 As it contains tongue and groove cladding throughout, it is also suitable to be used as a workshop, home gym or home office. 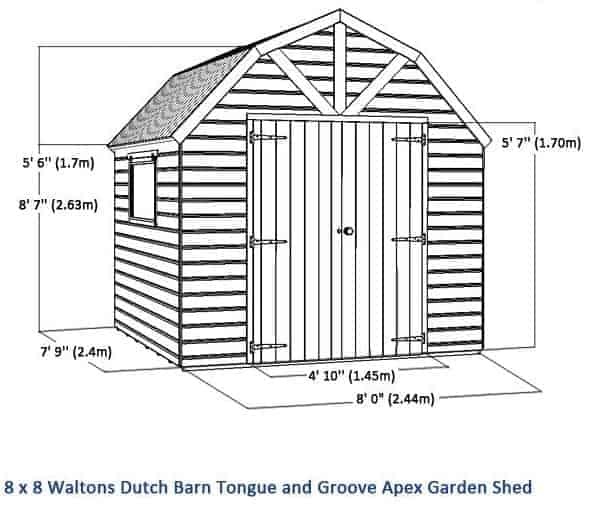 The measurements of the Dutch style barn sheds are impressive. Both the height and the width of the doors are what make this building truly stand out. If you compare it to standard 8×8 storage sheds, you’ll find the doors usually measure around 0.75m. So at an amazing 1.45m wide, you can see just how much of a difference you get this this model. So why is the width of the doors so important? Well, it determines how easy it is to transfer machinery, equipment and furniture in and out of the shed. As you benefit from so much width, you’ll be able to move even the largest furniture in and out with ease. The height shouldn’t be ignored either. It doesn’t only make the storage of taller equipment easier, but it also makes a big difference to how comfortable it is to move around in. 12mm tongue and groove cladding makes the roof and floor of this building extra strong. This is a great feature as a lot of sheds these days are supplied with solid sheet materials. 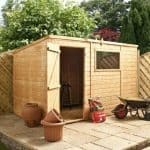 Whilst these help to bring the costs of a shed down, they don’t tend to be that strong so many people find they have to spend additional money upgrading it. There’s no need to do that with this shed so you’re saving money in the long run. 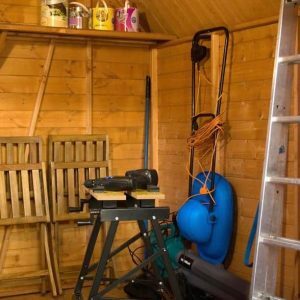 However, we would say that although the tongue and groove floor is exceptionally stronger than solid sheet boards, if you’re going to be storing heavy gym equipment such as a cross trainer, it would be worth adding a little bracing just to keep it protected. The roof is also given additional protection with the free heavy duty mineral felt. Whilst it does feel a little thin, you should find it provides great protection against the rain for many years. 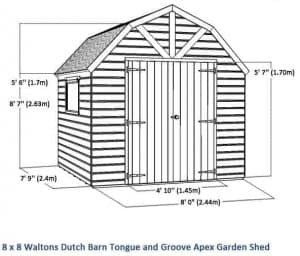 All of the Dutch style barn sheds are created with 12mm Shiplap tongue and groove cladding. 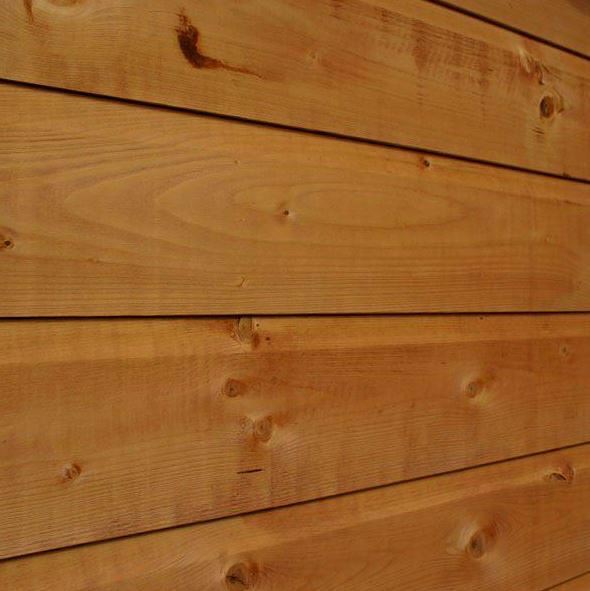 You can’t get a higher quality cladding than this and it is known to be incredibly durable. If you compare it to the cheaper 8mm overlap sheds, you realise just how much thicker the walls really are. It isn’t just the thickness that makes it stand out however. Take a look at the panels and you’ll see they have an incorporated channel running centrally across the timber. This is actually a very good water drainage system. It isn’t only water that Shiplap is resistant to. It is also less likely to warp. When you place an overlap clad shed in a sunny area for example, it is prone to warping. 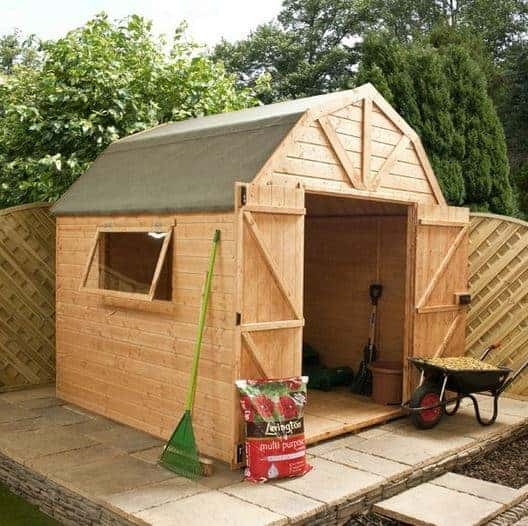 With this shed you don’t need to worry about where you build it. If worst case scenario it does warp, there is an expansion gap built into the walls to allow for any changes. So the structure is protected and you don’t have to worry about it affecting the shed’s stability. The framing follows the same high quality as the structure. Walton’s have stuck to a traditional 28mmx28mm frame though it is planed and rounded; giving it a smoother finish. This also makes sure the timber is smooth, eliminating any splinters and leaving a more seamless design. The treatment requirements for Shiplap clad sheds is slightly different to that of overlap. Due to the fact that the cladding is more resistant to the elements, it doesn’t necessarily require annual treatments. 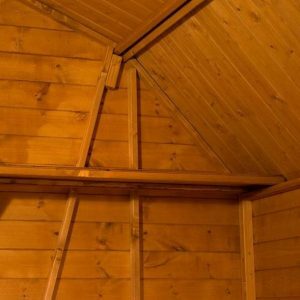 If you use a good quality, well-known spirit treatment, you could benefit from only having to treat the shed once every two to three years. You will need to check the manufacturer’s directions however as not all of them offer such long protection. A spirit treatment works deep into the timber, penetrating through the wood and creating an internal barrier. It also leaves a barrier on the surface, creating double layers of protection. Like anything, they do have their downsides. One is the fact they are more expensive, the the second is that they aren’t available in many different colours. So if you’re hoping to change the colour of the shed, a water treatment would be your best option. Waltons actually give you a free Golden Brown water treatment, saving you money on the first year. Unlike spirit treatments however, these will need to be reapplied once a year. Whichever treatment you decide upon, providing you follow the directions and maintain the treatments as required, you’ll receive a 10 year anti-rot warranty for the building. 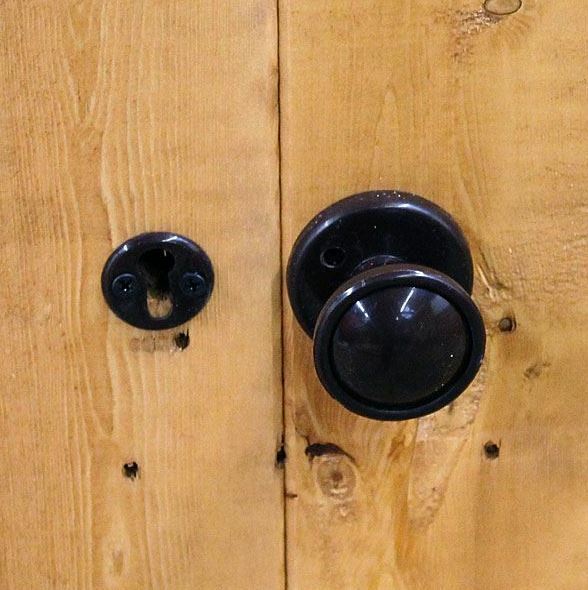 The doors are a leading feature of this barn style building. Think about it, barn doors are known for being huge. 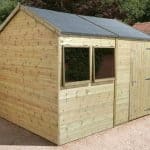 The double doors featured on this shed are no exception and they ensure you can get anything in and out both quickly and easily. You could even comfortably get a ride-on lawnmower through the doors without any awkward positioning. They also feature the popular ‘Z’ bracing. Diagonal cross beams protect the top and bottom of each door, preventing them from sagging through daily use. One of the more unusual design elements of this shed is the fact it comes with a styrene glazed window. It isn’t just the fact that a window is included in the first place that’s unique, it can also be opened. This allows you to get good air flow into the interior, really helping with ventilation. It will also ensure you are more comfortable in the warmer months; particularly if you use it as a home gym, office or workshop. 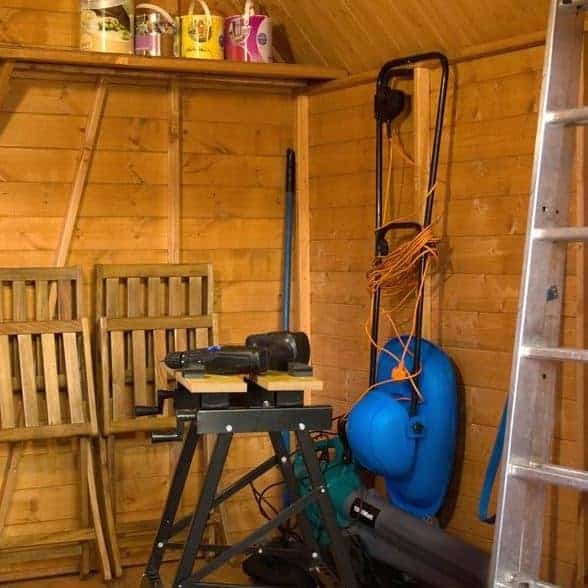 Waltons have taken the security of this shed seriously, not only ensuring it has solid, thick walls, but by installing a Rim lock on the double doors. You’ll find at most, a lot of sheds come with a butterfly catch or pad bolt. These require extra security to keep thieves at bay. With the Rim lock, you don’t need any other lock and you can rest in the knowledge that your equipment is safe. Of course the window does pose two issues. The first is the obvious privacy restrictions it provides. If privacy is a particular concern for you, we’d suggest putting up a curtain or a blind. The other issue it poses is that as it can be opened, there’s the potential for a thief to use it as an access point. Taking additional precautions such as installing an automatic outdoor sensor light would help to deter thieves and boost security. One customisation option we’re a little surprised to see is the extra strength floor support pack. The shed already comes with an impressive 12mm tongue and groove floor. As an extra incentive, Waltons have also provided a free floor support pack measuring 28mm. So whilst the extra strength support kit can be essential for buildings which offer solid sheet floors, it’s not really needed here. Superior Duty felt on the other hand could prove a worthwhile extra. Technically it isn’t an essential upgrade, but it can add to the roof’s longevity and give you better reassurance. The supplied heavy duty sand felt does feel a little thin which leaves you wondering how long it will actually last. The superior option comes with a self-adhesive backing and it benefits from strong fibreglass construction. This material is much less likely to wear down over time. It also provides the added benefit of adding more style to the building. Treatments may be a requirement, but they also provide another way of customising the appearance of the shed. We find it interesting Walton’s don’t list many treatments as extras with this building. They do have a large amount on offer, but you’d have to purchase them separately if you want a different colour than the ones shown. They do give you a free 5L tub of Golden Brown treatment with the building so this does save money on the first year’s treatment. The customisation options may be limited, but there are also a couple of other extras you may find useful. In particular, we’d recommend the wooden shelving sets. There are 3ft, 4ft and 5ft sets available, most featuring two tiers. One of the sets offers three tiers for those who have a lot of additional storage. These sets have a standalone design and simply sit on the shed’s floor. They have been manufactured with 16mm tongue and groove timber, maintaining an exceptional strong and long lasting design. Even the heaviest of toolboxes will sit comfortably and safely on top of these shelves. As the building comes with a Rim lock, the 49mm weatherproof padlock isn’t an essential. It does come with a hasp and staple so you can use it simply to give the shed a little more security. Obviously more security can never be a bad thing! The Dutch Barn range is one of our favourites not only for its attractive design, but for its incredible quality. Even just to look at this shed you can tell it has been manufactured to an outstanding standard. Even without the protection of regular treatments, you have a long lasting shed here. Its cladding and roof covering help to provide great natural resistance against the elements. However, we highly recommend you treat the shed in order to ensure it lasts. Being a mid-size shed, you do have a fairly great amount of space here. It isn’t just the floor space you have available either. You also have the option to add interior shelves. It’s advised you only attempt to build this with two people. Walton’s supply you with everything you will need to assemble the building and what’s refreshing is the instructions are very detailed and clear. Everything should fit together perfectly and it shouldn’t take more than 3-4 hours to put together. Taking into account the storage space, quality of the structure, security and additional benefits, it’s clear you’re getting brilliant value for money. This shed is also guaranteed to last for at least a decade. Final Thoughts: This is one of the more attractive garden sheds on the market, but it doesn’t just look good. With an unusual, stylish design apex roof, this building comes packed with brilliant weatherproof features. 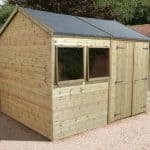 Its all-round tongue and groove cladding also makes it one of the most rigid and structurally secure sheds you can invest in. We like that the doors come fitted with a good quality Rim lock and there’s a great 10 year anti-rot guarantee for peace of mind. You also don’t need to spend much money on extras if you don’t want to thanks to the existing high quality features that already come with the building. 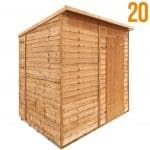 So all in all you have a great value for money, long lasting, private and secure shed.